I am the Messenger follows 19 year old Ed Kennedy, an underage cab driver who spends his spare time playing cards with his friends Richie, Marv, and Audrey (his crush since forever) or bonding with his dog, The Doorman. In comparison to his siblings, who have left to college or already have a family, Ed is thought of as the only one with no real life. But when Ed inadvertently stops a bank robbery, his life take an interesting turn. A few days after the court hearings an ace appears in Ed’s mailbox with three addresses on it. Before he knows it, Ed embarks on a mission, solving the aces and giving messages to each person or family he is sent to. With each message Ed continues to wonder, just what has he gotten himself into? And who is sending him the aces? I thoroughly enjoyed reading this book and could not put it down once I started. Zusak does an amazing job showing the growth in Ed’s character as he fulfilled each ace and illustrating the emotions he went through. There were moments in the book that pulled at my heartstrings and moments that inspired me. While his message may be a little cliché, Zusak makes it clear in a way that is thought provoking. I am the Messenger is a book that I believe, in many ways relates to what many young people are going through currently. 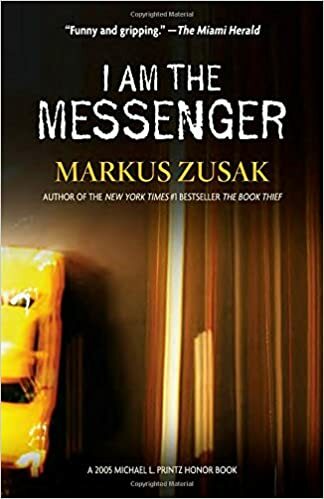 In my opinion, I am the Messenger is a moving book that finds a creative way to say that no one is worthless and even the most ordinary people can make the biggest difference in the lives of others.